The Musica Mundi School will be located at Fichermont, on the territory of Waterloo – a green and pleasant residential suburb with easy access via road transportation, conveniently situated some twenty kilometers south of Brussels. 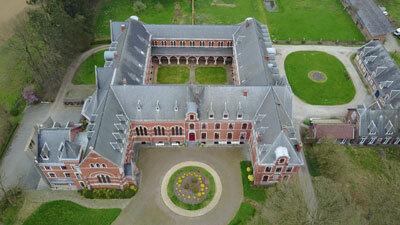 Thanks to an exceptional collaboration between the Archdiocese of Mechelen-Brussels and Musica Mundi, the Musica Mundi School will be created in the former Dominican Monastery of Fichermont – a quite exceptional location indeed, part of the listed and fully preserved area of the battlefield of Waterloo where, in the aftermath of the First World War, it was decided to create a monastery to pray for Peace and for the victims of deadly conflicts, in particular those who fell in Waterloo on 18 June 1815. The Fichermont project for the Dominican Monastery was supported by generous donors, whose names are engraved in the Salle de la Parole, at the entrance of the building. With the departure of the Community Le Verbe de Vie from the site of the Monastery, the Archdiocese and Musica Mundi have reached an agreement for the creation of the Musica Mundi School in those premises, a project fully consistent with the ideals of Peace and Reconciliation which inspired the founders of the Monastery. Musica Mundi will uphold these values, will preserve the site and respect its spiritual dimension. Once a year, a concert will be dedicated to Peace and Reconciliation. The building was erected during the 1930’s, with classical architecture, solid but elegant proportions and quality materials such as local stone, iron and wood. Internal features have been preserved – floors, wood panelling, doors, banisters in wrought iron… and great, old radiators. With its numerous rooms, dining quarters and adequate public areas, this three-storey building over the ground floor, organized around a large quadrangle, is ideally suited to host a school. It develops some 12,000 sq. meters, allowing for the gradual expansion of the school. It has been well maintained and is in good condition. It will have to undergo some limited upgrading and adaptation, so that Musica Mundi can start operating the school in September 2018.